He grunted something vaguely outraged at her, leaving his drink after the first burn of it warmed his throat. Vanya’s blue eyes sparkled, and he cupped her cheek, running his thumb over her skin. Tal dropped a credit chit on the table and stood, offering her his hand. She rose gracefully to her feet and led him across the dance floor, her steps light as the two of them slipped out the door. In the cooler common hallways of the station, they both took a moment to check their weapons and their notebooks. Tal had three alerts in the last minute indicating that a partial facial match had been made on someone heading for the docking bays. In true form, they were all coming from different corridors on different levels. Unless Frey had learned to clone himself at will, he was on to them and already hacking their feed. “I wonder…” Tal didn’t finish the thought, fingers sliding over his notebook as he diverted more of the station’s resources to his own use. “He’s cloning someone, all right, but not himself.” Holding out the pad for her to see, he shook his head in amusement. According to the station-wide trackers, Tal was currently standing in the hallway with his wife and heading towards the docking bay of their ship. “Sabotage,” Tal said without hesitation. He hoped he was wrong, that Frey wouldn’t be that stupid, but Vanya merely nodded and ducked into the nearest lift. He kept watching on his notebook as flickers of misinformation sprang up all over the station. When the door to the lift slid open, he tucked the pad away, and they spilled out with their weapons drawn, sprinting down the deserted corridor in the direction of the more populated docking areas. “And there we are,” Vanya whispered triumphantly as the familiar figure disappeared around the corner. There was only one way up or down the corridor, but they hugged the walls for the limited cover provided by the bulkheads. Frey wasn’t a violent man, but he also wasn’t used to being cornered, and they had blast guns for a reason. Tal wasn’t expecting to find Frey leaning against the sealed docking pod, his hands clearly visible in front of him as he smiled faintly. Tal watched the slow smile spread across his wife’s face out of the corner of his eye, most of his attention still on their mark as he stood there waiting to be restrained. “Well, I thought to myself, what do you get for the bounty hunter who has everything? Sorry about the wrapping job,” he said with a wave of his hand to the black bodysuit he was wearing. Tal snorted as he caught Frey’s other hand, slapping the binding cuff on it and waiting while the tight plastic was suctioned down to an immobile glove over Kellen’s all-too-nimble fingers. Vanya holstered her blast gun and started patting Frey down, grinning the whole time. “My, my, you are well-appointed.” She took a slender, tightly rolled tool kit from a pocket near his hip. Van dropped it into his hand with a slight frown, and this time there was no missing the unhappy crease between Kellen’s eyes. “Let’s have a look, shall we?” She pulled a slender pick from Frey’s collar and a few single shock-packs from his pockets, but on the whole it didn’t seem as though he’d been out with any particular mischief in mind. Vanya handed Tal Frey’s notebook, but a quick glance showed it to be a tangle of encryptions that Tal would try to defeat later. For the time being he simply shut it off, relishing the sudden death of the alerts beeping on his own device. “Let’s get him into the cell so we can process the claim.” Tal keyed in the entry code for their docking pod, then bent down for the retinal scan. “Finally,” muttered Kellen, and Tal narrowed his eyes. There was always a game with Frey, always a con to be unraveled, and he was smart enough to realize that finding the biggest rundown of their career sitting on their doorstep probably wasn’t the gift from the gods that it seemed. Their holding cells were converted crew cabins, and they only had two of them. Vanya, ever the gracious hostess, gave Kellen a choice of which one he wanted. A gentle shove through the door sent him stumbling into the small space. Tal entered the lock code, stepping through the door of the cell and letting the clear panel slide closed. He waited for the locks to seal, then motioned to Frey, who turned around obediently and waited while his hands were freed. Tal’s jaw tightened as Kellen cracked his knuckles, but all it took was a raised eyebrow and Frey was unzipping his bodysuit, revealing the whole lot of nothing that he was wearing underneath it. “Did you want the full floor show?” Fingers toying with the zipper, Frey paused as it parted just below his waist. “Your loss.” Frey stepped out of the suit without fanfare, though he did seem to be fighting a smile and losing. “I’ll try to live with my disappointment,” Tal said dryly, catching the body suit when Frey tossed it at him. 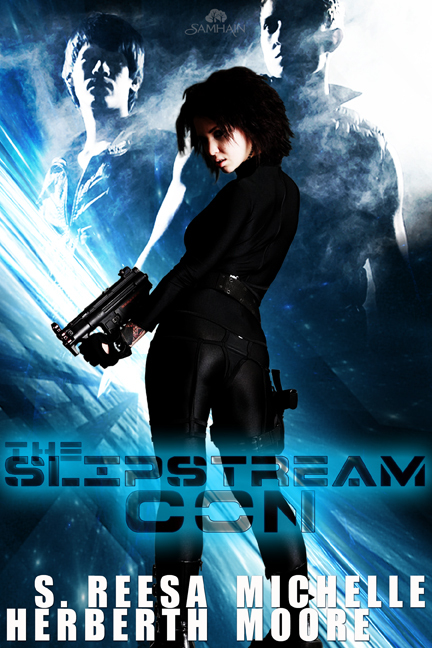 The Slipstream Con – Space opera with a twist, available now from Samhain Publishing.